It was over a breakfast discussion of holiday treats that we began a muffin conversation. A coworker lamented about not having a muffin for breakfast and I offered to bring some in the next day. I thought, I’ve not cooked in awhile, and having just made soup the previous day, I was on a bit of a roll, if you can call it that. After a run for a haircut, I stopped by the grocery store to pick up the baking essentials, and by another store for my muffin baking pan. I decided to make banana muffins because of how comforting bananas can be in cold weather. The smell of banana bread on a winter morning is enough to get me out of bed. I abstained from putting nuts in it, in case any of my coworkers were allergic to them. And my high hopes of adding cranberries for that extra zing, were dashed when I realized that Christmas-ready shoppers bought up all that the store had. 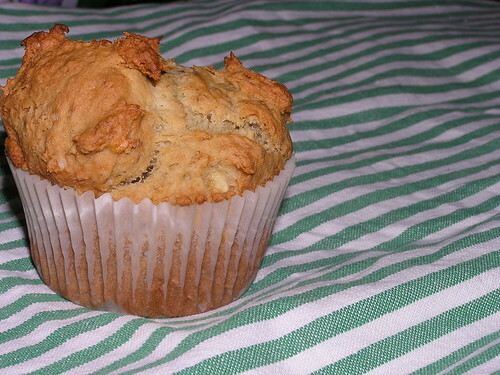 So these are pretty plain-Jane muffins, yummy as they are. Perhaps adding a bit of lemon zest would have done the trick? I think this now, a bit late for this batch, which has already been hungrily consumed by my team, ready for their Christmas to commence. What I did add was a bit of vanilla extract, because Radish loves all things vanilla and a teeny tiny pinch of cayenne pepper. Trust me, on this. 1. Preheat oven to 350 degrees F. Place paper liners inside the muffin baking pan, or coat it with butter. 2. Sift together the flour, baking powder, baking soda and salt. Set aside. 3. In a large bowl, combine bananas, sugar, egg, melted butter, vanilla and cayenne. Gradually fold in the flour mixture, and beat until smooth. Scoop into muffin pans. 4. Bake for 25 to 30 minutes. When you tap the muffin, it should be slighly soft and spring back upon touch. I’d check on them after 18 minutes or so. I like the sound of these muffins, radish. When I was growning up, my mom always made banana bread at Christmas that we would nibble on while we were opening presents. Vanilla and cayenne sound like they would definitely transform my childhood fave into an adult treat! Catherine – so glad you liked them!